Thanks to everyone for the concern and prayers over Jace the past few days. Since I've had little chance to talk to most, here's the scoop... I took Jace to the doctor Thursday when I noticed that he was working really hard to breathe. Upon testing his oxygen levels, the doctor immediately called the paramedics, and in about 4 minutes we were being whisked away to the emergency room. It was scary as my mommy instincts knew before I took him in that something was really wrong. As I suspected, he tested positive for RSV, but also had pneumonia in both lungs. We hoped to only stay for the afternoon, but that turned into an overnight stay, which then turned into another overnight stay. Fortunately, for me, they did not put an IV (is that right ... IV?) in him, though the ER nurse really wanted to. 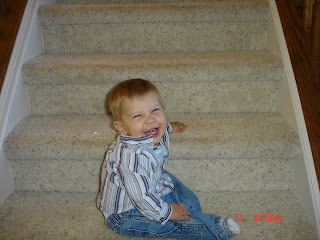 They let him come home today on oxygen, and we will go to the doctor Monday to see how he's doing. We've had so much support, and I have to tell everyone how grateful I am. My friend Rachel watched Rana and Owen while we were in the ER; my friend Joy brought a meal for Scott and the kids (she didn't even ask, just did it); my friend Kim is bringing a meal tomorrow; Scott's family prayed like crazy; my sisters worked to get my mom up here to help; my friend Joy also gave us a nebulizer and all the Albuterol treatments that Jace will need (She doesn't read my blog, so I'm not buttering up!) and countless other friends prayed, called and offered to help. I also can't forget my husband who had a couple of really hard days with work and the kids. It's definitely a time of reflection for me ... a time to count my blessings and thank God for the life of our baby boy. Scott and I are rich -- 2 very supportive families, and great friends who go beyond the call of duty. It's very amazing and even overwhelming to think about. We may never have the opportunity to give back, and yet that's what loving Christ and others is all about. What a humbling and beautiful thing. 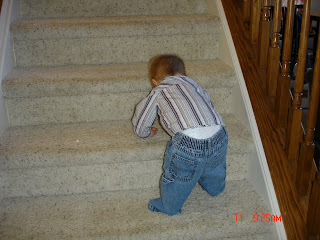 These pictures of him were taken this past Sunday when we discovered that he can climb the stairs. I'm so glad Jace is doing better. You're in our prayers. I know all that kid-sick stuff is scary. Hopefully this is the only thing you guys will get this season. There's so much respiratory-viral stuff going around that I'm even getting a little paranoid. Anyway, we should set up a phone tree prayer thingy, or email list thingy, or whatever. I'm not going to be in charge of it. OK, well I typed up a post last night, but I don't see it here, so I guess it didn't go through. But anyway, I'm so sorry you all had to go through that. That must have been a very scary mom moment, having your baby whisked away to the ER. Poor little guy. I'm glad you have a great support group up there. Keep us posted on Jace. Praise God he's ok! I had no idea or I would've been praying too! I really hate having so many miles between us, but Praise God you are surrounded by Christlike people! I can't imagine that helpless feeling as they put him on a stretcher and into an ambulance. So glad he perked up fast and home so quickly!